You are here: Home › Ambulance Services › Civil Servant thanks colleagues who helped save his life. Civil Servant thanks colleagues who helped save his life. 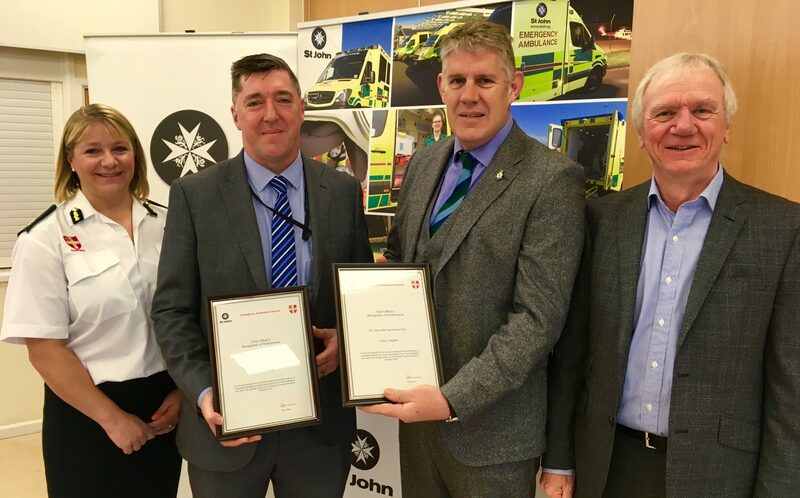 Two members of staff from Frossard House who performed CPR (cardiopulmonary resuscitation) on a collapsed colleague have been recognised for their actions by the Chief Officer of the St John Emergency Ambulance Service. Colin Vaudin and Chris Welsby gave life-saving first aid to Jon Williams after he suffered a cardiac arrest at work on the fifth floor of the States of Guernsey offices in October last year. Colin Vaudin, a retired army officer with first aid training, was sitting a few meters away from Mr Williams when he collapsed at his desk, while Chris Welsby, a trained first aider who previously served with the Royal Navy was in the office next door. The pair received the Chief Officer’s Recognition of Performance Award for their prompt and efficient actions. The certificates were presented by SJEAS Chief Officer Ali Marquis and chairman on the SJEAS board Steve Le Page. Two emergency ambulance clinicians who treated Mr Williams, paramedic Dom Fletcher and EMT Nick Peters, also receive the Recognition of Performance Award. As the senior clinician Dom Fletcher took charge of the resuscitation and administered Advanced Life Support before Mr Williams was transferred to the Emergency Department. Firefighters from Green Watch of the Guernsey Fire & Rescue Service who also attended the incident were also thanked for the role they played as co-responders. Mr Williams said “I am indebted to Colin and Chris for their prompt action and to everyone else involved. If it wasn’t for their combined efforts I would not be here today and I have so much to thank them for”. Anyone wishing to learn or refresh their first aid and CPR skills or learn how to use an AED can contact St John Training by email info@firstaidtraining.gg or by phone on 247979. Automated External Defibrillators are also available at the St John HealthCare shop at the Rohais.